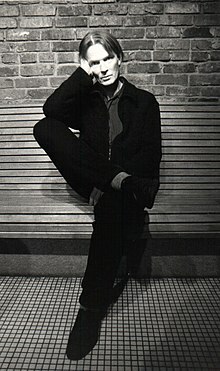 For other people with the same name, see Jim Carroll (disambiguation). 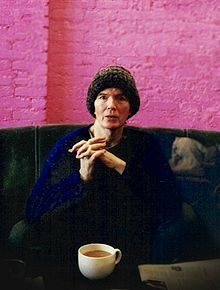 James Dennis Carroll (August 1, 1949 – September 11, 2009) was an American author, poet, autobiographer, and punk musician. Carroll was best known for his 1978 autobiographical work The Basketball Diaries; the book inspired a 1995 film of the same title that starred Leonardo DiCaprio as Carroll. Carroll was born to a working-class family of Irish descent, and grew up in New York City's Lower East Side. When he was about 11 (in the sixth grade) his family moved north to Inwood in Upper Manhattan. He was taught by the LaSalle Christian Brothers, and his brother in the sixth grade noted that he could write and encouraged him to do so. In fall 1963, he entered public school, but was soon awarded a scholarship to the elite Trinity School. He attended Trinity from 1964 to 1968. Carroll was a basketball star in high school, but also developed an addiction to heroin. Carroll became sober in the 1970s. He briefly attended Wagner College and Columbia University. Carroll identified Rainer Maria Rilke, Frank O'Hara, John Ashbery, James Schuyler, Allen Ginsberg, and William S. Burroughs as influences on his artistic career. Carroll's marriage to Rosemary Carroll ended in divorce, but the two remained friends. He also dated Patti Smith. While still in high school, Carroll published his first collection of poems, Organic Trains. Already attracting the attention of the local literati, his work began appearing in the Poetry Project's magazine The World in 1967. Soon his work was being published in elite literary magazines like Paris Review in 1968, and Poetry the following year. In 1970, his second collection of poems, 4 Ups and 1 Down was published, and he started working for Andy Warhol. At first, he was writing film dialogue and inventing character names; later on, Carroll worked as the co-manager of Warhol's Theater. Carroll's first publication by a mainstream publisher (Grossman Publishers), the poetry collection Living at the Movies, was published in 1973. In 1978, Carroll published The Basketball Diaries, an autobiographical book concerning his life as a teenager in New York City's hard drug culture. Diaries is an edited collection of the diaries he kept between the ages of 12 and 16, detailing his sexual experiences, high school basketball career, and his addiction to heroin, which began when he was 13. In 1987, Carroll wrote a second memoir, Forced Entries: The Downtown Diaries 1971–1973, continuing his autobiography into his early adulthood in the New York City music and art scene as well as his struggle to kick his drug habit. After working as a musician, Carroll returned to writing full-time in the mid-1980s and began to appear regularly on the spoken-word circuit. Starting in 1991, Carroll performed readings from his then-in-progress first novel, The Petting Zoo. In 1995, Canadian filmmaker John L'Ecuyer adapted "Curtis's Charm", a short story from Carroll's 1993 book Fear of Dreaming, into the film Curtis's Charm. In 1978, after he move to California to get a fresh start since overcoming his heroin addiction, Carroll formed The Jim Carroll Band, a new wave/punk rock group, with encouragement from Patti Smith, with whom he once shared an apartment in New York City, along with Robert Mapplethorpe. He performed a spoken word piece with the Patti Smith Group in San Diego when the support band dropped out at the last moment. The band was originally called Amsterdam, where they originally formed and were based in Bolinas, California. The musicians were Steve Linsley (bass), Wayne Woods (drums), Brian Linsley and Terrell Winn (guitars). They released a single "People Who Died", from their 1980 debut album, Catholic Boy. The album featured contributions from Allen Lanier and Bobby Keys. The song also appeared in the 1985 Kim Richards vehicle Tuff Turf starring James Spader and Robert Downey Jr., which also featured a cameo appearance by the band, as well as 2004's Dawn of the Dead, and in the 2015 Mr. Robot S1 E10. It was featured in the 1995 film The Basketball Diaries (based on Jim Carroll's autobiography), and was covered by John Cale on his Antártida soundtrack. The song's title was based on a poem by Ted Berrigan. Later albums were Dry Dreams (1982) and I Write Your Name (1983), both with contributions from Lenny Kaye and Paul Sanchez (guitar). Carroll also collaborated with musicians Lou Reed, Blue Öyster Cult, Boz Scaggs, Ray Manzarek of The Doors, Pearl Jam, Electric Light Orchestra and Rancid. Carroll, 60, died of a heart attack at his Manhattan home on September 11, 2009. At the time of his death, he was in ill health due to pneumonia and hepatitis C. He was reportedly working at his desk when he died. His funeral Mass was held at Our Lady of Pompeii Roman Catholic Church on Carmine St. in Greenwich Village. ^ a b Mallon, Thomas (December 6, 2010). "Off the Rim: Jim Carroll's "The Petting Zoo"". The New Yorker. Condé Nast: 90–93. Retrieved December 27, 2010. ^ a b c Williams, Alex (September 25, 2009). "The Last Days of Jim Carroll". The New York Times. Retrieved April 9, 2018. ^ O'Hehir, Andrew (April 12, 1995). "A Poet Half-Devoured – Jim Carroll Feature Articles". CatholicBoy.com. Retrieved December 18, 2012. ^ Goldman, Marlene (January 8, 1999). "Mercury Rising (1999) – Jim Carroll Interviews". CatholicBoy.com. Retrieved December 18, 2012. ^ "Living at the Movies, First Edition - Books by Jim Carroll - CatholicBoy.com". Catholicboy.com. Retrieved July 10, 2009. ^ Woo, Elaine (September 14, 2009). "Jim Carroll dies at 60; poet and punk rocker wrote about travails in 'The Basketball Diaries'". latimes.com. Retrieved December 18, 2012. ^ "The romance of junkie paranoia". The Globe and Mail, September 14, 1995. ^ Smith, Patti (2010). Just Kids. New York: HarperCollins. pp. 162–164, 166–167. ISBN 978-0-06-093622-8. ^ MacAdams, Lewis (September 16, 2009). "Remembering Jim Carroll". The Los Angeles Times. Retrieved December 18, 2012. ^ "CatholicBoy.com". Catholicboy.com. Retrieved February 27, 2013. ^ "CatholicBoy.com". Catholicboy.com. Retrieved April 10, 2010. ^ "Edelweiss". Edelweiss.abovethetreeline.com. Retrieved April 20, 2010. Wikimedia Commons has media related to Jim Carroll.